No matter what the occasion, there's nothing quite like sitting down with a classic cream tea! Whether you're looking for a light brunch option, an afternoon tea, or the perfect gift to treat someone you love, the Cornish Cream Tea is the ultimate comfort food that can be eaten al fresco in the sunny weather or enjoyed as you curl up in the comfort of your living room over the colder months (read our list of places to enjoy your cream tea for more inspiration). At Classic Cornish Hampers we put quality and satisfaction first - so to get you in the mood, take a look at our list of the most elegant, traditional and scrumptious gift hampers, each with their own individual twist to suit any taste you're looking to cater for! Perfect for setting up a lovely summer tea party in the garden, you can't go wrong with this delicious cream tea hamper! 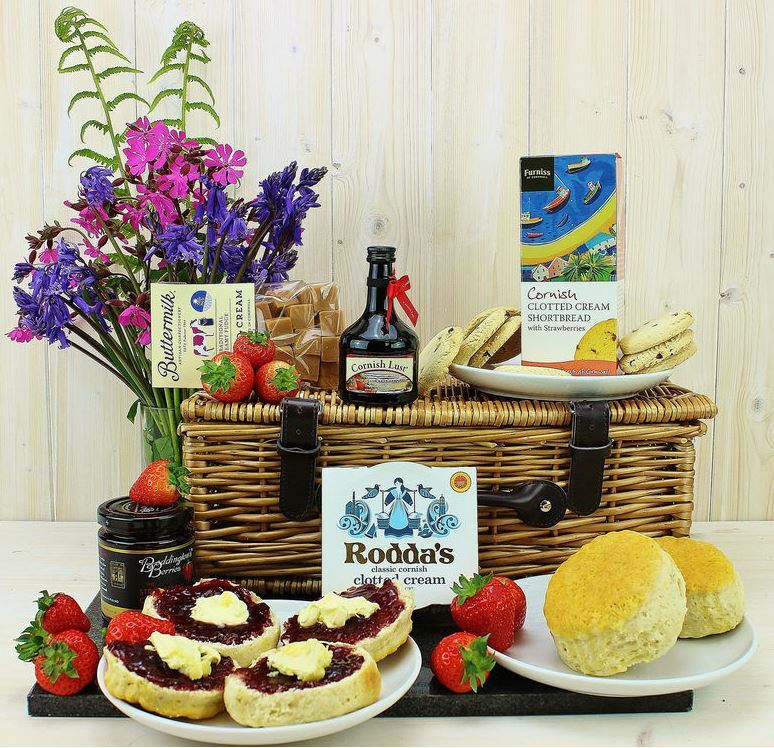 Bursting with irresistible hand-picked ingredients, your guests will enjoy an authentic slice of Cornish tradition with this no-nonsense gift box complete with expertly baked handmade scones, silky smooth clotted cream and Boddington's strawberry jam. 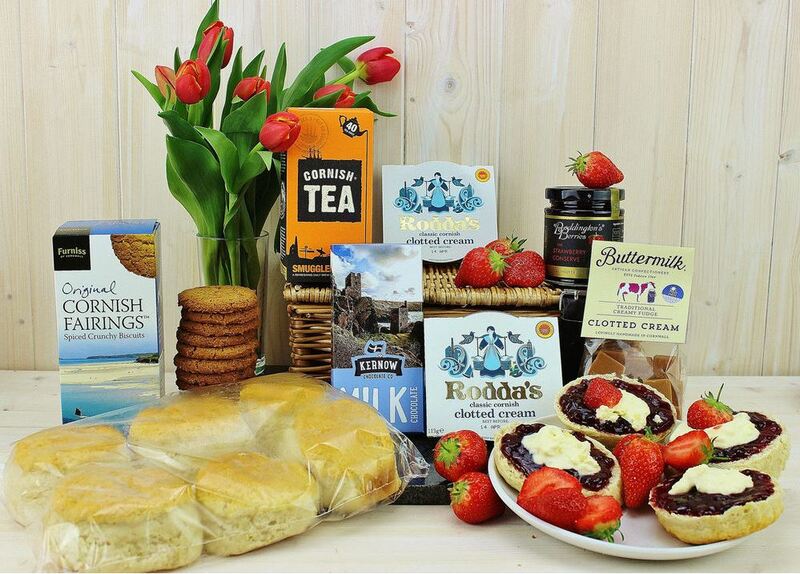 For fans of the windswept Cornish landscape and the rustic charm that comes with it, this Poldark themed cream tea hamper is made for those looking for something to go with their favourite TV series! 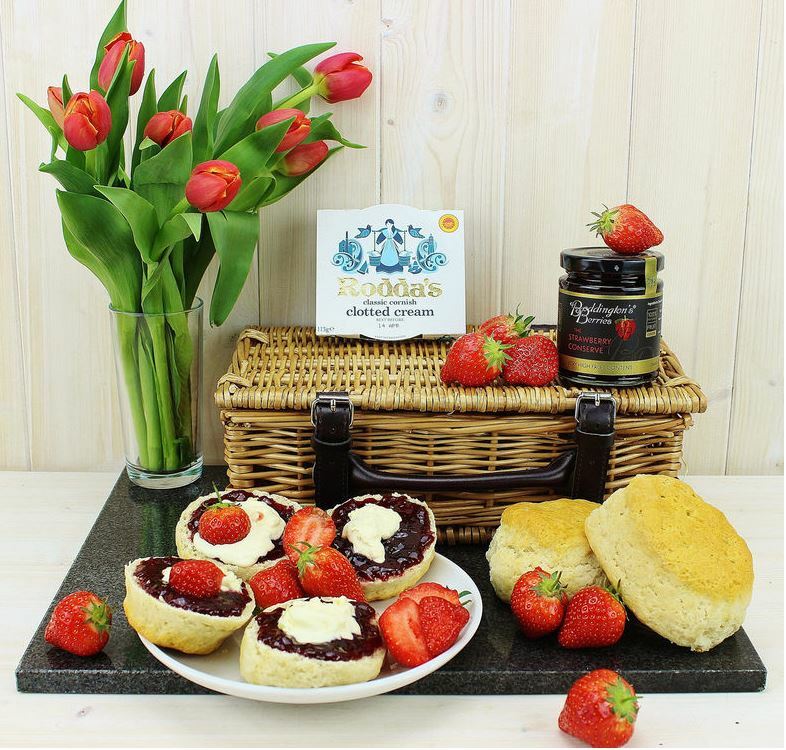 A truly indulgent gift box complete with not only the all-important ingredients to make your scones, but Cornish Smugglers Brew Tea Bags, Kernow Chocolate Co. Milk Chocolate, and much, much more to satisfy your Cornish cravings! A cream tea set with a scrumptious strawberry twist! 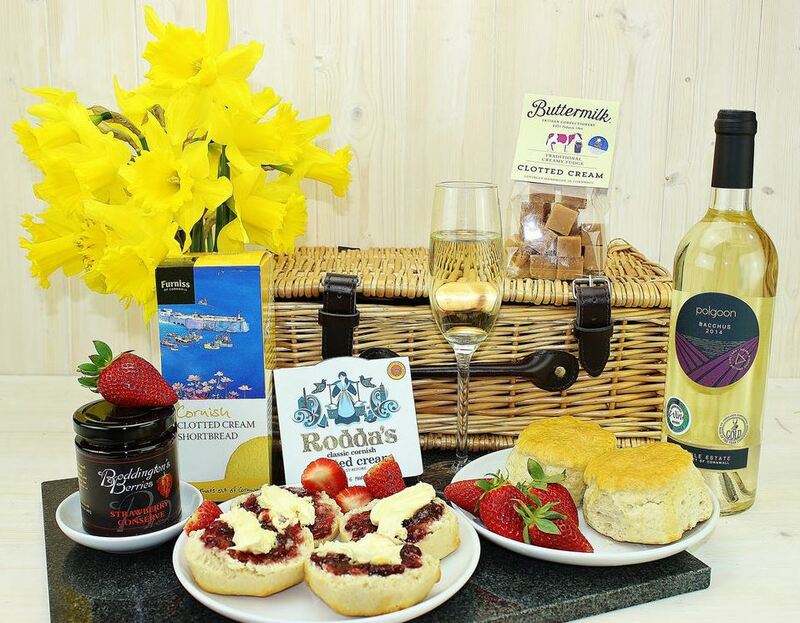 This hamper melds together your cream tea essentials with a few extra comforts including Furniss Clotted Cream & Strawberry Shortbread, and to drink, Cornish Lust Liqueur - a wine based drink with a sweet kick of strawberry. Ideal for birthdays, anniversaries and everything else in between! More of a coffee fan than a tea drinker? 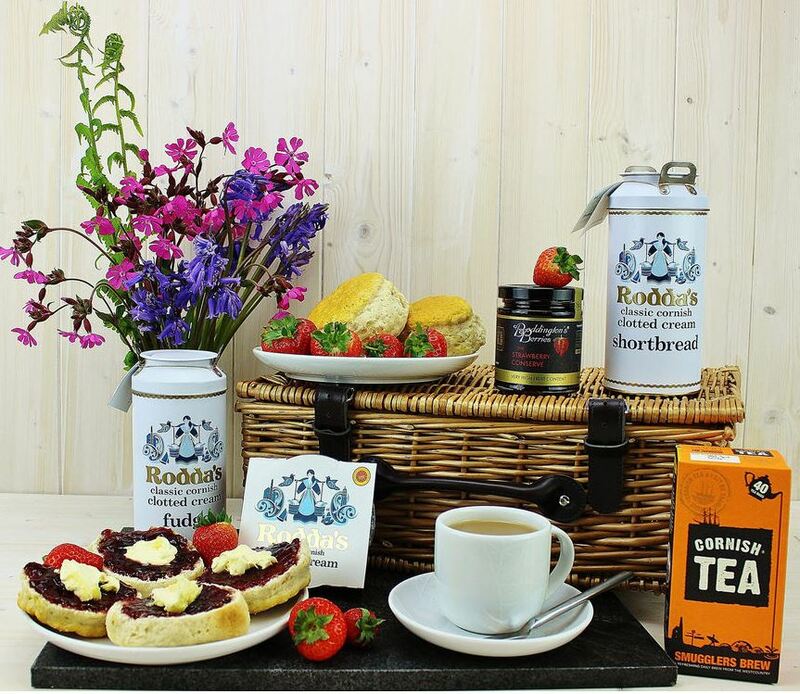 This great little alternative to the classic cream tea hamper will give you a great mid afternoon kick as well as an unmissable cream, jam and scone experience. Features Italian blend dark roast coffee with a subtle hints of chocolate for luxuriously sweet finish. Packed with goodies, there's a reason we call this a special hamper! 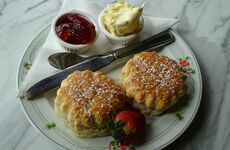 We couldn't finish off this list without our most luxurious cream tea selection. Featuring lavish strawberry jam, clotted cream, Chapel Bakery scones, and that's not all... Indulge in Buttermilk Clotted Cream Fudge, Furniss Clotted Cream Shortbread and choose from either a Polgoon White Bacchus wine or a Rondo & Pinot Noir Red - for a truly magical experience! 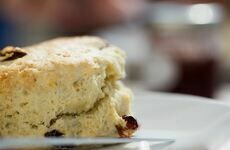 To discover the true Cornish way of enjoying it, read our 'best way to eat a cream tea' blog. There's something about the winning combination of scones, jam and a dollop of clotted cream that begs the question - what is the history of the Cornish cream tea?